Thank you for registering for The 18th Annual Novo Nordisk New Jersey Marathon Weekend. In an effort to make your participation more enjoyable, here is the tenth in the series of weekly messages. Copies of these updates are also available on our Website. Post-Race Busing to Monmouth Park: Road closures require return busing to begin around 9:15 am. During your wait enjoy the: Finish Line Festival Bands, raffles, vendor food, shop for official race gear, have you finishers medal engraved, sign up for a massage, etc. Pre-paid parking at Monmouth Park: We strongly suggest the pre-paid option. Click here for a pass or purchase one at the Expo for ($5). Parking passes will be $10 on Race Day on exit! The Start/Finish Location: The 5K, Kids’ Races, Kid’s 1.2 Mile Marathon, Kids Move The New Jersey Marathon Run and Family Festival will be held at the Oceanfront Promenade in Long Branch: between the Ocean Place Resort and Rooney’s Restaurant. Additional information is available on our website. Getting to the Start: There are no anticipated road closures on April 26th. Good access should exist from the west via Rt. 36, from the north via Rt. 36 and from the south via Ocean Ave. / Blvd., and all local roads. Race Day Registrations: Race day registrations at the start line will be available until 8:25 am. Bag Check: There will be a bag check area set up near the start/finish line. We are pleased to provide a link to our “green” Novo Nordisk New Jersey Marathon Information Booklet. We hope that it will be a useful recap of information about our entire weekend of activities for you and your supporters. Here’s a link to maps for each of our races plus the Start & Finish Line Festival Areas all in one place. Don’t delay in registering for our half and relay as they may sell out at any moment! Please note: As people switch races, defer or drop out we’ll fill each newly open slot from the wait list, but there’s no guarantee. So, if you missed the registration period for your race please get on the wait list soon as some people will be offered entry through that channel. Please note: Our 5K race will continue to take registrations until its max number has been reached. We are planning to take registrations on race day (Saturday, April 26th) for this race, unless of course it sells out during the Expo. Registrations for the Kid’s 1.2 Mile Marathon on Saturday are offered thru affiliated charities only. Race day registration for this event will likely be available as it has never sold out, yet. 4. Start Line Parking – one more time! There is no free parking in and around Monmouth Park, the site of our Start Village and Start Line. Last year some people experienced long waits to exit the parking lots after their race. This year, in order to address those issues, we have created a pre-pay option ($5 either online or at the Expo). Pre-paid parkers will have their own exit line and will hand a ticket to the attendant and they’ll be on their way. Those who did not pre-pay will also have their own exit line. BTW – we have hired a different group to take cash (only) this year and they will be making change whenever necessary. The cash only fee will be $10 at the exits. IF everyone who didn’t choose the pre-pay option comes with a $10 bill that line will move as fast as the pre-paid line. Save money and time by choosing the pre-pay option though as that is not likely to happen! We have posted a link on our website to find your bib number and other important registration information. Many have already used that link successfully. So far the link has been available ONLY for anyone who registered prior to 4/1. However, starting on Monday evening, 4/21, everyone who registered prior to the close of on-line registration will be included). Please enter your last name, click “Search” and either print out that screen of information or write down your bib number and bring it to Packet Pick-up at the Expo, along with your official government issued ID. Finish times will be available soon after you complete your race, in a number of ways: 1) download a free QR Code Reader/Scanner to your smartphone and you can simply scan the QR Code on your bib, 2) you can ask a friend with a smartphone and QR Code Reader/Scanner to scan the code on your bib for you, 3) you can go to the “Awards and Results” Tent in the Finish Line Festival Area and volunteers there will scan your bib for you, 4) you can also get your finish time via a link on the main page of our website. Here’s a QR code to test your QR reader/scanner. It will take you to our currently blank race results page (no finishers yet)! In the middle of the Finish Line Festival Area is the Reunion Area, a place to meet your family and friends after your race. To locate it either check the Finish Line Festival Area map or look for the big gorilla as you get near the main stage. Return busing to Monmouth Park will begin around 9:15 am (or when the course is clear of athletes). We are unable to begin sooner as the roadway between the finish area and Monmouth Park will still be closed due to the race. Please note: Loading of the buses will be by corral order initially (A then B) in order to allow those athletes who finished earlier, and their supporters, first access to the buses. The initial wave of athletes and spectators will be gathering in the bus corrals from about 9:00 to 10:00 am. As that wave of riders starts to dissipate the bulk of the half marathoners will finish. After 10 am boarding will be open for everyone and will continue until 4:30 pm. See below for a list of things to do after your race. We will again provide a free runner tracking service during our Full and Half Marathons. A link will be posted soon to sign up for the service. It will be on the main page of our website and posted on our Facebook page and Twitter feed as well. 10. Last Call for Volunteers! We still have a few volunteer positions open for race week shifts (April 23-27). If you’d like to be part of the action and involved in some of the many activities required to put on this weekend long event, we would be glad to find a spot for you. Send an email right away to: Volunteers@NJMarathon.org, as we’re almost full. Enjoy meeting race staff, past and current champions, dignitaries, etc. in the VIP Area at Rooney’s (pre-registration is required). NYC and Northern NJ athletes; take the train to the race – simplify race day transportation on Sunday. Rock to Brian Kirk and the Jirks at our Finish Line – Brian and the boys are back, by popular demand! Enjoy a meal while cheering for family/friends on the race course at locations in and near the finish area. This will be my last update prior to race day. I hope that these ten weekly messages have made your planning for race day a bit less complicated, and that you know more about all the great things to do at our Expo, what to expect on the course during your race, about our new 5K and Family Festival and Kids Races on Saturday, and at our Finish Line Festival on Sunday. We all hope that you thoroughly enjoy your time with us. Please follow us throughout the year on Facebook, Twitter and on our blog to learn about the new things which we have planned for 2015, and to join us for our free: clinics, training runs, adventure runs, and the races which we sponsor throughout the year! We look forward to being a training/running resource for you year round and hope that you will stay in touch as we are interested in you as athletes and not only as participants in our races. 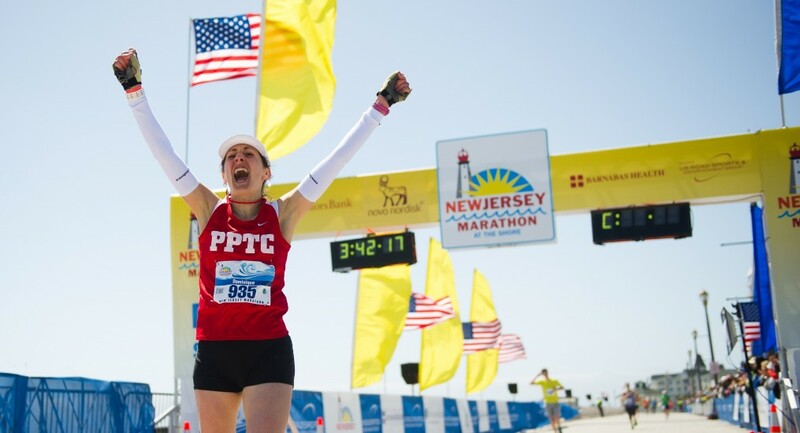 This one’s for you New Jersey and runners everywhere, as we welcome our friends and neighbors from across the state, the country and from around the world! This year we are celebrating YOU as we encourage you to, “Let Your Star Shine” during your weekend with us. Here’s your mantra for race day, “Be Brilliant”!! May you shine brightly on race day and throughout the year, fellow athletes! You inspire us each day with your determination, dedication and good humor, as you work through the many issues involved in endurance sports! Congratulations to each of you as you strive to be better than you were yesterday! Best wishes during your training, racing and throughout the year! We look forward to you joining us again in 2015!